It's the time of year to get the heart shaped Hama bead pegboards out again! This year I have made some spinning heart decorations for Valentine's Day. They feature an inner heart suspended in the middle of a larger heart frame, and when hung up by the ribbon the smaller heart will hang and spin inside. 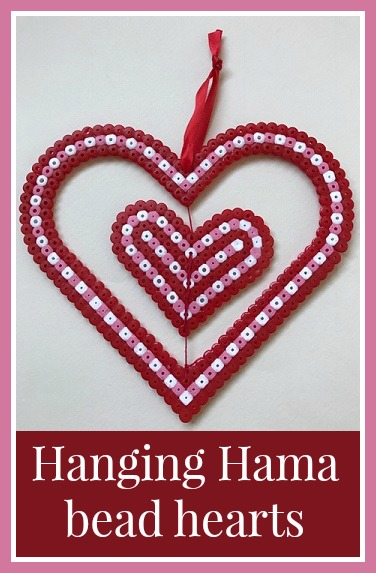 These Hama bead decorations are made using the large heart pegboard for the outer frame and the small heart pegboard for the smaller hanging heart (affiliate links). I've used a mixture of red, pink and white beads, along with some red thread and ribbon for hanging. These are the designs that I used for my hearts. I found that a border of three beads worked well for a sturdy frame, allowing for a variety of different designs. The designs are created on the two separate boards, then ironed on both sides to make sure that they are sturdy. This is especially important for the larger heart frame, as they are a little more fragile. Then you need to use a thick needle and thread to sew through the holes in the beads. It's easier to do this while they are still warm as the plastic will be softer, but as long as you haven't over ironed the beads you should find it quite easy to pierce the plastic with a needle. I sewed a line down the centre of the heart to make sure that it remained firmly in place. The thread is secured at each end with a tight knot. Finally I used the same needle to thread through some ribbon for hanging. You can't really see the spinning hearts very well in photographs, so I've made a little video showing them in action. They are great to hang on door knobs or window handles so that the smaller hearts can spin freely. 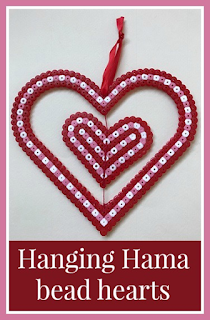 If you like these Hama bead hearts you might also enjoy my previous Valentine's Day Hama bead crafts using the same large and small heart pegboards. I made a ribbon hanging heart decoration for Valentine's Day using the small heart pegboard and Hama bead heart frames using the large heart pegboard. Those are lovely! I suppose you could put them outside too to spin in the wind.